No...when I try 40M I lose WIFI altogether. lobster2: No...when I try 40M I lose WIFI altogether. thats weird. perhaps the device you're using has a cheap/old wifi card in it then. is it 802.11n? Yeah, Broadcom 802.11n Network Adapter - link speed of 130Mb/s. Used to be able to get link speed to 300Mb/s on old router if I played with adapter settings but can't get above 130 on VB104W. Are you using VB104W? If so what is your top WIFI speed? lobster2: Yeah, Broadcom 802.11n Network Adapter - link speed of 130Mb/s. Used to be able to get link speed to 300Mb/s on old router if I played with adapter settings but can't get above 130 on VB104W. if you have a better wireless router, ild simply convert that into a WAP and use it for wireless..
i dont use the wifi on it, i use my apple airport express. its great. Yeah I tried that and got up to 30Mb/s but hoped to keep everything to one router to eliminate some clutter on the table....might have to look at replacing with a better VDSL modem/router down the track - any suggestions on a good one? that depends on your definition of a "good one" you seem to want to expect wireless to be absolutely the best possible situation but simply theres too many variables for that. if your purely looking for better wireless performance, your better off going with a higher grade WAP. Can you shed me more light on your setup? I have exactly the same gear as yours, VB104W + AP Express. I am undecided on the following two options. Which one you reckon it will work better than the other? Any comment will be thankful. vdsl modem does the DHCP, the airport express is in bridge mode and all it does is provide wifi. I've been trying to set up RADIUS on my server but it hasnt been working, need to find my windows server disc to reinstall it and start again. Thanks for the reply, Hamish. I was trying to find out if the modem can be as good as AP Express. If so, I can use the Express as a range extender to cover the whole house. Yep the wireless is garbage on this device. NZCrusader: Yep the wireless is garbage on this device. i dont recall the exact price point, but wasnt the VB104W meant to be a bit of a cheaper VDSL capable device? that would surly run it into cutting corners, wireless is an easy one to cut. I personally haven't had any issues with the wireless myself. Wireless speeds are roughly 95% of the speeds I can attain on an ethernet connection which is 38MB/s down, and 9.7Mb/s up. Neori: I personally haven't had any issues with the wireless myself. 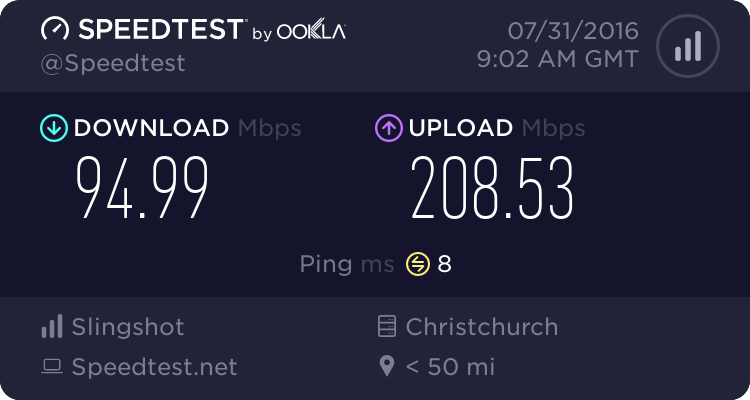 Wireless speeds are roughly 95% of the speeds I can attain on an ethernet connection which is 38MB/s down, and 9.7Mb/s up. thats exactly the expectation ild run with too..
if you want good wireless speed, you need to be willing to spend a little on decent gear.. even more so in dense wireless areas.